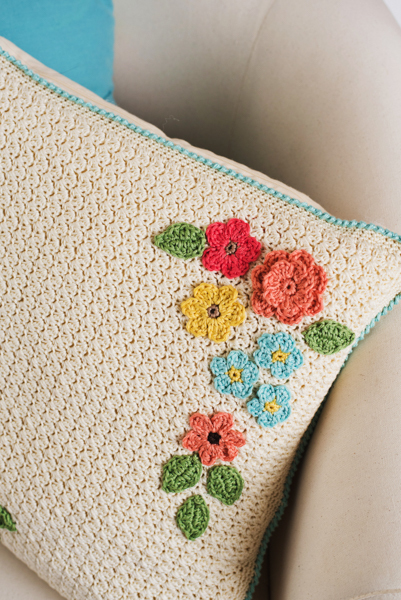 Inspired by the many flowers of spring, this pillow is a chic update to your home. 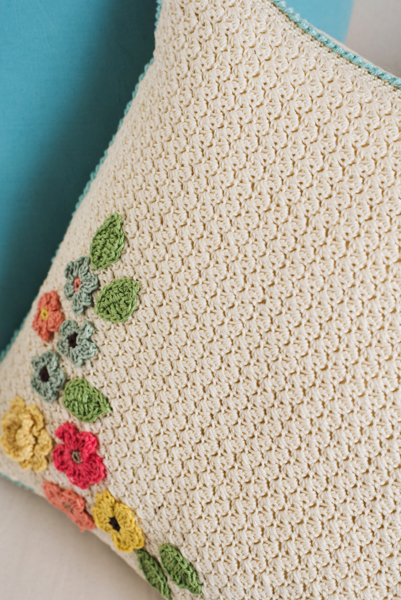 An easy textured stitch pattern makes this pillow a pleasure to crochet. Make some sweet flowers and leaves to embellish and you’ll be ready for the new season. Ch 1, working from left to right, sk first sc, insert hook from front to back in next sc to the right, yo, pull lp through st, yo, pull through 2 lps on hook. Repeat as indicated in pattern. Pillow front is attached to a readymade pillow to save time. 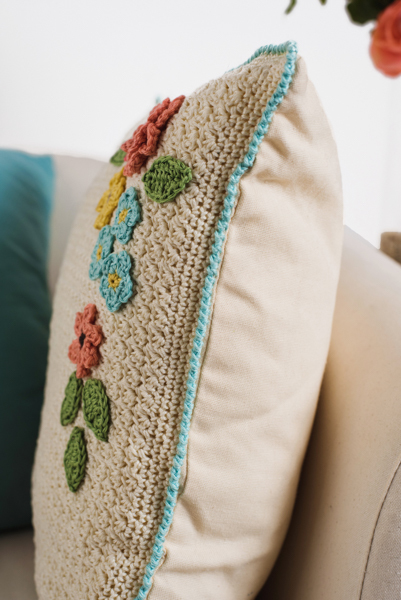 The flowers are made separately and attached to the pillow by seaming. 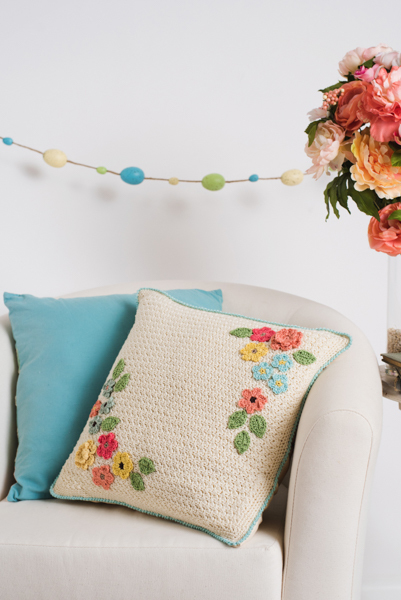 Any scraps of cotton yarn can be used for the flowers. Design uses vintage inspired shades of coral and yellow for the flowers with accents of brown, sage and cream. You could choose to make flowers to match your décor! With MC and larger hook, ch 67. Rows 2-65: Ch 1 (counts as sc), dc in first st, *sk next st, (sc, dc) in next sc; rep from * across to last 2 sts, sk next dc, sc in t-ch, turn. Note: On last row, do not turn. Continue to Border. Rnd 1: Cont with MC, ch 1, work sc evenly spaced around all edges of Pillow, working 3 sc in each corner, join with sl st in first sc. Note: Mark centre st of each 3-sc corner with a stitch marker. Rnds 2-3: Rep Rnd 1. Fasten off. Rnd 4: With CC2, ch 1 and work Reverse Single Crochet around edge of Pillow. With smaller hook, make flowers and leaves in 3 sizes using photo as guide. Change color and join in any st.
Ch 4 and sl st to first ch to join. Rnd 1: Work 14 sc into ring, join with sl st to first sc to join. Rnd 3: Working behind Rnd 2, sl st into sp between 2 petals (insert hook into 2 lps to create a stable base to work from), ch 3, *sl st into sp between next 2 petals, ch 3; rep from * 5 more times, join to first sl st.
Rnd 1: Sc in 2nd ch from hook, hdc in next ch, dc in next 3 ch, (2 hdc, ch 2, sc in 2nd ch from hook, 2 hdc) in last ch. Working on opposite side of beg ch-7, dc in next 3 ch, hdc in next ch, sc in last ch, join with sl st to first sc. Fasten off. Weave in all ends on Flowers and Leaves. Using picture as a guide, sew all Flower applique in place on Pillow Front. Lay pillow piece on readymade pillow and pin in place, stretching where needed. 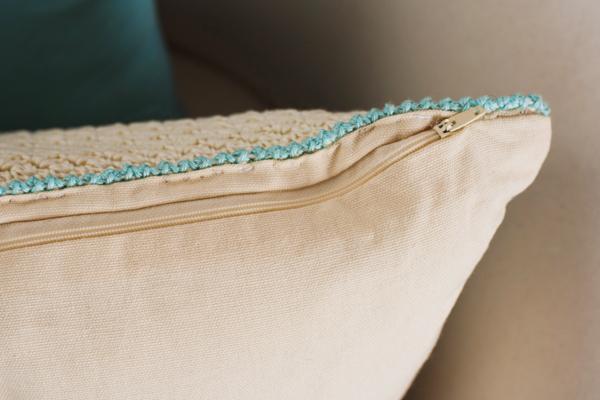 Using matching sewing thread, whip-stitch around. Hello. If you are viewing on your desktop, photos are on the lower right side of the written instructions. This photo problem is being reviewed and hope to be fixed soon. I hope this helps. Thank you! I was wondering where to find the pictures of the items too. I have been around and around in circles trying to find any pictures! It seems like common sense to have a picture with the actual pattern. Where would It find a photo of the pillow? I used to be able to to go each section and there see a photo and if I was interested click on it and see the pattern. Now I can only click on the pattern and see the item down at the bottom. I was unable to print more than the leading part (page 1) of this pattern. 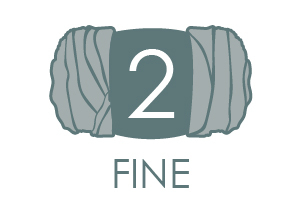 How do I go about accessing the entire pattern to print? 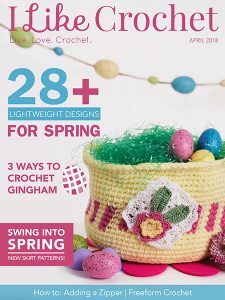 I love the look of crochet cables but I’m too intimidated to take that next step. Any tips to get over my cable fear?